Gwyneth’s Gift Foundation would like to thank all of those who attended our Ribbon Cutting Ceremony on January 30, 2019! We appreciate the time that over 40 attendees took to visit and celebrate with us. We invite you to like our Facebook Page and browse through the photos from the event! 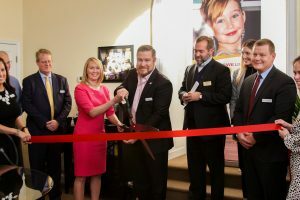 Joel and Jennifer Griffin cut the ribbon in honor of Gwyneth’s Gift Foundation’s grand opening. As we enter this new phase, Gwyneth’s Gift encourages the community to visit us! We are open Monday through Friday, 8 A.M. to 4:30 P.M. and would be happy to assist you in answering questions regarding our Foundation Programs, scheduling a training event or applying for an AED. Once again, we thank our community members for their continuous support in our mission and for joining us as we begin on this new journey.